Michaelmas is one of my favourite days in the church's year, almost entirely because of the season in which it falls: it's an autumn feast, the last glow of fiery summer, and the golden leaves of angels' wings (as in this window at Winchester Cathedral, above) seem to flutter in harmony with the unleaving of the trees. I couldn't resist posting today two of my absolute favourite hymns, which both speak of angels and angel-song. 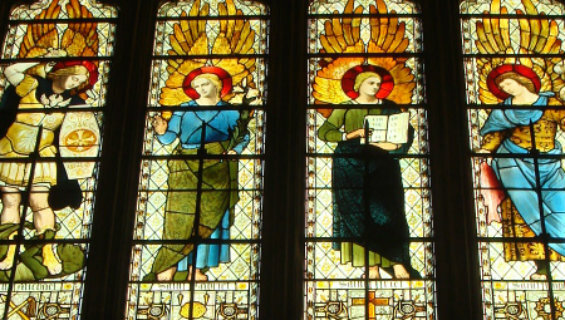 Neither mentions St Michael directly but both do something almost better: they begin with the angels' singing and work downwards through creation to our singing, and then upwards again to God. Both acknowledge how weak human praise can be; one asks for the angels to assist us in our singing, and then takes delight in the contribution that a heart properly 'tuned' can make to the general song; the other takes comfort in the idea that human endeavours of music and art come from God and return to him, pleasing to him because he made them for that purpose. My favourite kind of hymn is 'hymns about hymns' - songs about singing, carols about the joy of carolling, such as these two Victorian examples, or this medieval one. For me, this kind of hymn adds immeasurably to the experience of worship, and allows us to participate in such a gloriously joyful picture of heaven; sometimes I think such hymn-singing is the only experience on earth that's anything like heaven at all. 'Ye holy angels bright' is an adaptation by J. H. Gurney of a text written in 1681 by Richard Baxter, and the tune is by John Darwall. I always think this hymn has something of George Herbert about it, especially that last verse - 'a well-tuned heart' is Herbert through and through. Isn't it just the most wonderful phrase? The rhymes in these verses - especially between 'rejoicest' and 'voices' and then between 'voices' and 'choicest' - are just about my favourite thing in hymnody (or psalmody, perhaps I should say. Are there any other hymns which contain the word 'psalmody'?!). It might as well be a different universe! And only twelve years before I was born. What on earth happened to this world? The little church at Ickham in Kent was the subject of one of my first church-visiting posts (and still, I think, my favourite). The first time I went there in 2009 it was late in the afternoon of New Year's Eve, and the light was fading fast; the church was all shadows and grey bare glass. The invisible, unlighted Christmas tree reaching out feathery branches into the darkness only added to the strangeness of the experience. But I went to Ickham again last year on Michaelmas Day, and it was like a different place; I never got round to posting those pictures last year, so here they are now. This was the same Michaelmas day I went to Canterbury Cathedral and found it suffused with golden light; that was at Evensong-time, and the light at Ickham, earlier in the day, was no less warm and honey-coloured. The sky was cloudless blue, the leaves were just beginning to turn, and it was quiet as nowhere can be quiet but a country village on an autumn afternoon. Around the church, the trees were bright with yew berries. The church is dedicated to St John the Evangelist, and there he was amid the flint of the porch, just as he was there, looking much greyer and darker, when I visited on Old Year's Day. This tomb is the effigy of William Heghtresbury (William Heytesbury), a fourteenth-century logician and philosopher who was a Fellow of Merton College, Oxford, and Chancellor of the University from 1371-2. Despite his starry academic credentials, when he died in 1373 he chose to be buried in this church where he had been Rector in the 1350s. First the scholar, then the knight; this effigy is of Sir Thomas de Baa (or Bay). Someone had placed a dried stalk on his breast, where his sword might have been. A memorial to Charlotte Katharine, daughter of Sir Samuel Egerton Brydges (who sounds like quite a character!) and wife of Frederick Dashwood Swann, who died in 1841: "To a quick and cultivated intellect, an amiable disposition, and a benevolent heart, she joined an earnest sincerity of purpose, and unaffected simplicity of manners, upheld by a deep sense of religious duty and a firm faith in the mercies of her Redeemer." I liked this photograph on display of the church choir in 1928. 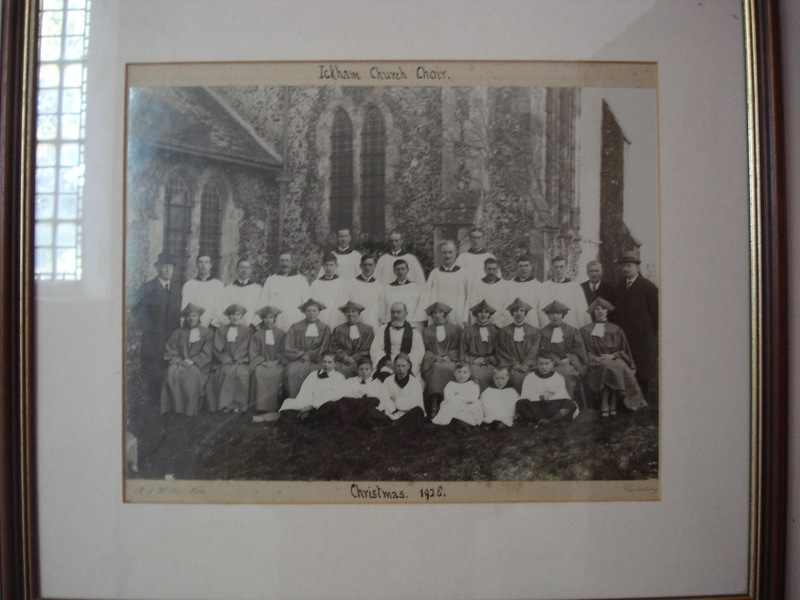 Ickham is such a tiny village - where can they ever have found so many choir members? At Christmas, the font was filled with holly and ivy and painted pinecones; this time it contained sunflowers, bright but drooping, as if as a reminder that summer was over. This is a medieval English metrical translation of a section from the 'Te Deum', 'Tu Rex gloriae, Christe'. It was written in the early fourteenth century by William Herebert, Francisan friar and lecturer in Theology at Oxford; I've posted a number of his many translations of Latin hymns before. I'm not sure if my posts on Herebert's hymns have successfully conveyed this fact to people who aren't familiar with Middle English, but as well as being a prolific translator Herebert was a highly skilled one: in most cases, he was translating Latin hymns whose structure does not lend itself naturally to English verse, but he makes effective use of rhyme, metrical regularity, and English vocabulary to express concepts which are not always easily condensed - and he does this while being accurate and faithful to the sense of the original. Because of their poetic qualities, his translations have a way of getting into your head and being simply unforgettable, much more so (for me) than the Latin texts they're based on. His 'What is he, this lordling? ', for example, has a insistent, demanding, raw power that sends shivers down the spine. "Ich it am, ich it am..."
Translation into verse is an extremely hard skill to master, and good hymn translators rarely get enough credit - people who've never tried it tend to think that anyone can do it! But Herebert was not only one of the first people to turn Latin hymns into English poetry; he still ranks among the best. Ask a hundred people who was the first English hymn-writer, and I bet a good proportion of them would say Isaac Watts, or maybe one of the Wesleys; poor Herebert is quite forgotten. But he spoke the English you speak (if you're reading this!) and he wrote so that people could understand the hymns of the Church, and commit them to memory, and pray with them. And he did it well. I find it particularly interesting that in this case, even though he's translating a part of the 'Te Deum' - which, in Latin, is rhythmical prose, with varying line-lengths - he chooses to make it into regular, rhyming couplets. This makes it attractively ordered and controlled, as well as memorable. Personally I find the Latin 'Te Deum' just a tiny bit (am I allowed to say this?) boring from a poetic point of view, and English translations of it which go along with that are equally unmemorable. Herebert has made poetry of it; his version charges along, triumphant and exulting, full of praise. Some of his vocabulary is interesting, too, because he never simply borrows the Latin word he's translating - like most English translators of his period, he pays serious attention to the question of how to render a particular concept in his native language (if only some modern translators had half Herebert's understanding of that!). I've talked about this before with regard to his subtle, intelligent translations of Conditor Alme Siderum and Veni Creator Spiritus. Here I'm especially struck by the line in the third couplet, "Thou openedest heuene-ryche to ryth byleues thrunchg". This is what is now often rendered into English as 'thou didst open the kingdom of heaven to all believers'. Herebert's wonderful addition - not quite a new idea, but a new shade of imagery and meaning on the existing idea - is thrunchg, which means 'crowd, host' - think of throng. It's here partly to rhyme with stunchg, 'sting' (as in death), but more importantly, I think, to conjure up the idea of a crowd of the faithful, thronging eagerly into the opened gates of heaven. Throng (very strongly in Middle English, and perhaps even today) denotes an unpredictable, moving, jostling crowd, not a well-behaved procession. Herebert has given us not just the accurate but rather pale phrase 'all believers'; he's encouraged us to imagine a great crowd of them, living and breathing people, thrusting forward into heaven as they sing their hymns of praise. It's especially appropriate because the 'Te Deum' is all about collective praise - 'the company of the apostles', 'the fellowship of the prophets', 'the army of the martyrs', and so on. Herebert has responded to that and enhanced it; he's done what only a good translator can. A meke maydes wombe thou ne shonedest nouht. Thou openedest heuene-ryche to ryth byleues thrunchg. Thou shalt comen to demen ous, we leueth al-to wysse. Whom wyth thy doerewourthe blod on rode hauest ybouth. A meek maid's womb hast shunned not. Thou didst open heaven's realm to the throng of faithful believers. Thou shalt come to judge us; we believe this to be true. Whom with thy precious blood on rood thou hast bought. 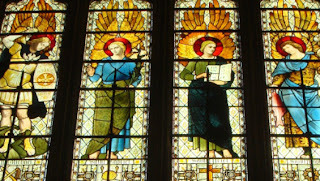 I always think that anyone who innocently stumbles across this blog might be rather puzzled by my fondness for collecting modern (that is, usually Victorian and later) depictions of medieval people in stained glass and other forms of church art. The art is not generally - though there are some exceptions - of the highest quality, and often has no interesting qualities except the identity of the person it depicts; so perhaps a little explanation for my interest is due before I begin to show you the variety of pigs, fish, monks, crowns, minstrels and flowers which adorn Evesham's stained glass windows. Until I started to study medieval English literature at university, I had very little idea of medieval history; it was not taught at my school, even in outline or summary form (I remember once doing something related to the Battle of Hastings in Year 7, but I don't think we learned anything more than that there was a battle, and a king called Harold got an arrow in the eye. I seem to recall we had to write and present our own TV news reports on the subject. I've since learned there's more to it than that, and also that Anglo-Saxons didn't actually have TV news - who knew?). As I've realised since I started to study medieval literature, this ignorance about medieval English history is pretty widespread in Britain, as witnessed by the fact that when I tell people what I study, they have no frame of reference in which to locate it. Usually people have heard of Chaucer, but can't even begin to guess which century he lived in; the phrase 'Anglo-Saxon' has no meaning to them as a historical term, and though they have usually heard of Beowulf, many of them are surprised to learn that it's considered English literature. Well, the English education system has apparently decided to give up on teaching children any English literature before Shakespeare, and that may now be a lost cause. But I do feel strongly that the lack of historical education about the medieval period is an appalling failure, and that my own schooling, for instance, could easily have sacrificed a handful of our hundreds of lessons on WW2 for the sake of the 1000 years of English history that comes between 'the Romans in Britain' and the Tudors. I want people to learn these things and be interested in them, and - this is where the topic of this post comes in - I would especially like to believe that English Christians might be interested in learning a little about the earliest history of their own church. Of course you can't force people to be interested; some people just don't like history, some people are attracted to other places and periods than medieval England, and there's a strong cultural imperative against it in many Christian churches - everywhere except the Church of England, really (I sometimes get the impression that traditionalist English Catholics think it's a bit too Anglican to be interested in English saints). But I'll keep posting about these things anyway, because it feels like the right thing to do. And so - why 'medieval people in modern stained glass'? 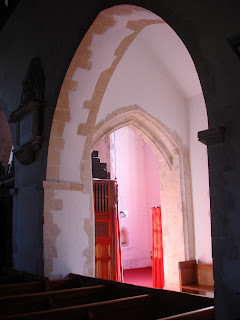 Because there was a time, beginning around the middle of the nineteenth century, when English churches started to be interested in their own medieval origins, and - no longer afraid of looking all Romish and idolatrous for caring about saints - began to celebrate those origins, and to commemorate their founders and forebears in the fabric of their churches. These depictions are usually tied to the particular Christian story of some particular place, and are thus a wonderful way both of learning those individual stories and of seeing how they've been interpreted and valued by our own immediate predecessors in the faith. The stories are all distinctive: the coming of St Augustine in East Kent and in Canterbury; the saints of the early Northumbrian church; the great kings and bishops of Wessex in Somerset and Winchester; here in Oxford, the story of St Frideswide, and St Birinus at Dorchester; in East Anglia, St Edmund and St Etheldreda and the story of Walsingham; and many more. They contribute to a sense of local Christian identity but also, perhaps more importantly, to a harmonious interaction between the local and the universal in the life of the Church. The scroll around the Virgin's head reads 'Ecce locum quam elegi', 'Behold the place which I have chosen' - the words which told Eof that the wasteland in which he was looking after his pigs ought to be the site of a monastery. These words appeared on the medieval scroll of Evesham Abbey. Isn't that beautiful? I love the king's crown and beard, and how their eyes seem to be meeting. In this period Mercia was the most powerful of the kingdoms south of the Humber; while the kings of Northumbria were already Christians, Æthelred's father Penda was a notorious pagan (at least in the eyes of the Northumbrian Bede), who was responsible for the death of St Oswald in battle. Penda's sons, however, adopted Christianity to allow for diplomatic marriages with the Northumbrian royal family, and Æthelred seems to have accepted the new faith enthusiastically. He helped found several other abbeys as well as Evesham, and supported other bishops as well as Egwin (Wilfrid of York, for instance, among them). The scene depicted in this window took place in 700 or 701, and in 704 Æthelred abdicated the throne and himself became a monk at Bardney. I don't really know why the monks are wearing deep blue rather than black (they were Benedictines), but I must say I like it. (Those are the arms of Evesham; if you compare them with the medieval stone depiction I posted the other day, you'll see this artist makes the padlock more prominent!). If you want to know what Anglo-Saxon keys really looked like (not much like this delicate object), have a look here. I don't know why the servant's clothes are so flowery! Egwin looks a bit nonplussed by the return of the key, as well he might. The large scene above these little ones depicts the consecration of the abbey. It was consecrated on All Saints' Day, 714 (or perhaps a few years earlier, but that's the date of the charter recording it) by Egwin and the man who would succeed him as Bishop of Worcester, Wilfrid. This kneeling king is so beautiful that I'm loath to spoil the effect by linking to the article for Ceolred of Mercia, whom he must be intended to be; Ceolred was not a very devout king. But his robes and sword are gorgeous. I must confess that I know very little about Simon de Montfort, but these windows are beautifully colourful and medievalish anyway. They reminded me a bit of the ones at Ash. I don't know whether thirteenth-century monks went to pray on the actual battlefield, as Anglo-Saxons monks sometimes bravely did, carrying with them the relics of their saints. There were several monks at the Battle of Hastings, from Waltham Abbey and from Peterborough - as I did not learn in my Year 7 history class. It's interesting to see that this artist, whose name I could not find out, hasn't attempted to make this look like 'Eof's vision of the Virgin' instead of a generic Marian figure in an architectural surround. The difference reflects the gap between these fairly uninspired compositions and the spirit of the Skeat windows, which delight in the exotic 'medievalness' of it all. And here's Eof, with a fat red pig. Dear me. Wouldn't a swineherd find bare legs rather chilly in Worcestershire? I only just learned, from looking up St Richard, that his attribute is a chalice at his feet because "he once dropped the chalice during Mass and nothing spilled from it". I told you these posts were educational. This window dates to 1954. It's interesting that the Skeat windows are from 1956, almost exactly contemporary, but these feel much more modern in style. Personally I prefer Skeat's winsome figures, though I can imagine some people might find them too pretty and sweet - for some reason they remind me a little of Pauline Baynes' illustrations for Narnia, with perhaps a similar kind of innocent charm, and the same close attention to detail. However, I do like the slightly unearthly colours of this window, especially around Eof - his pig is rather more realistic than Skeat's version! At the Virgin's feet is the bell-tower of the abbey, and an appropriate quotation from Isaiah which had me humming this song all the rest of the day.